The Fédération Equestre Internationale (FEI) has announced the launch of its first ever official mobile phone application. “FEI EquiTests”, developed in close cooperation with Canada-based e-learning and visual communication design specialists Numen Communciations Inc., is a mobile application designed to help riders learn, reference and practice FEI Dressage tests. “FEI EquiTests”, is available worldwide through the Apple iTunes store under FEI license. Keep up-to-date with the latest Dressage news through the FEI news feed. FEI EquiTests 1 is available for free, so that riders and coaches may evaluate the features available. This application includes all features related to one sample test: the globally used FEI Young Riders Individual Competition Test. 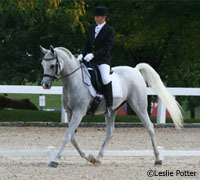 FEI EquiTests 2 includes all the most recent 2009 FEI Eventing Dressage Tests and is available for only $9.99. Additional versions of FEI EquiTests featuring FEI Dressage and FEI Para-Equestrian Dressage tests will be launched later this year. EquiCalc helps you calculate your horse’s weight by entering two measurements. EquiTempo is a metronome for riders to help keep their horse’s gaits steady and even. EquiList is a digital checklist to use when packing for a show. For more details visit the official websites at www.equiapps.com and the Apple ITunes store: FEI EquiTests 1 and FEI EquiTests 2. Sounds useful. I wish it would also emphasis which aids are necessary for each movement. It would be helpful for those of us who don’t have trainers. The EquiTests do sound neat and useful; but I hope this doesn’t encourage the use of handheld digital devices on horseback, or even really around horses. I once saw a woman riding a beautiful young grulla horse (in an arena, thank goodness), yakking away on her cellphone. Not only is that stupid and unsafe, but really, when you’re riding, you should be giving your attention to your horse, right? I dunno about anyone else, but when I’m riding, I want to be concentrating and enjoying the ride. Neat idea though, I’m sure it will help many (non-mounted) riders learn their dressage tests better.